An easy-to-wear and loose-fit top, ideal for yoga or pilates. A funny apple with a strong core!! This is an oversized fit which allows you to wear it over another t shirt and the loose cut makes it a very comfortable yoga top. The Apple Tree Pose design on this t-shirt is by Da Londra and it has been printed in London. 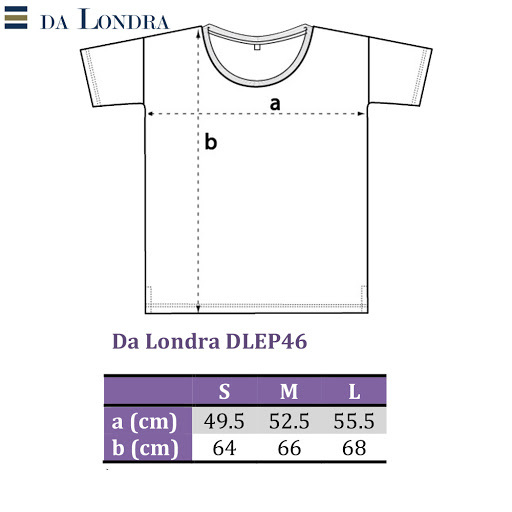 The t-shirt is packed in elegant Da Londra packaging and makes an ideal gift for lovers of yoga and pilates. This t-shirt is made of an incredible fabric which is soft, flowing, cool and comfortable. Tencel® Lyocell, to give it its full name, is a new eco textile that drapes well, is extremely soft to the touch, and yet is hard wearing and machine washable. Tencel® is made from the wood pulp of Eucalyptus trees certified by the Forestry Stewardship Council. The fabric is blended with 50% Organic Cotton for a better drape. The fabric is 140gsm jersey and therefore is slightly see-through, especially in the white colour.